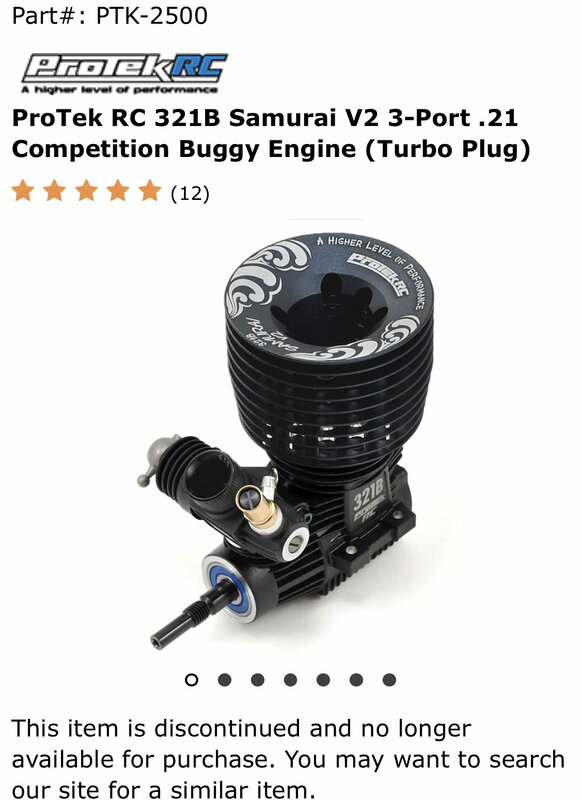 Went to buy a new samurai engine on amain and it's no longer on their site. Anyone know if it's been discontinued? Or maybe a v3 coming soon? interesting says discontinued on it. JQ said that os refused to make the vspec for anyone but amain(when they stopped making the jq motor) maybe a deal was made where someone else gets it exclusively. I think now that OS is supplying so many companies with OS Motors, that they are perhaps pairing the selection down. Now with FP offering the OS XRB based mill, who knows? Betcha a shiny quarter they replace it with a new Protek model by OS. The Samurai had a heck of an awesome run, starting way back when it was originally a VZ-B Speed Spec 2 many years ago. Still one of my favorite all time engines, sad to see it go. Protek will update it almost guaranteed. Harrison477 and BenPetz like this. Oooh! A shiny quarter?!? I'm not taking that bet! Yep, I bet V3 is around the corner. I marshaled your race last Sat, your car looked good out there. And that is not just because I am partial to orange. There’s a prototype V3 Samurai being tested right now. I’m looking at one right now. That’s all I can say about it at this time. largeorangefont and jersey like this. I've already got three of them. Cj jelin confirmed in a video of him testing at amain hobbies that their is a new protek engine. You’re entitled to your opinion, but you are incorrect. The people testing the prototype engine have some pretty strict rules mandated by AMain and Protek. We are prohibited to release any photos of the engine, we cannot give any details about the engine and all testing has to be done in private. Plus, we are not allowed to test the engine in any type of race. The time frame we were given to test the engine is very tight, so if those of us who are testing it give a satisfactory report on the engine’s performance, expect it to be fast tracked into production. It’s your choice to believe me or not and that doesn’t bother me. I just know that I am being completely truthful with my statements and you will see that the new engine will be available to the public very soon. MugenDrew, roblupo and jhold87 like this. New engine should be out already.... Why would discontinue something before you have the next version ready.